Food sustains us. Great food inspires us. 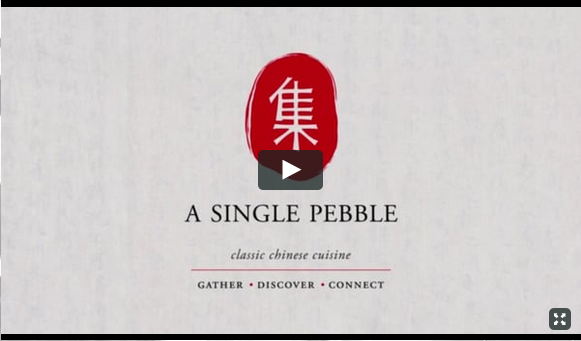 The classic Chinese cuisine at A Single Pebble does the latter. Here the vibrant flavors of the Silk Road come alive in the freshest ingredients from around the globe and just down the road; each bite brings a sense of history, adventure, and something even more sustaining, a taste of home. Like Chef/Owner Chiuho Duval’s personal journey from Taipei to Burlington to ultimately rediscover her childhood cuisine, dining at A Single Pebble gives guests the feeling of coming home. Meals are served family style, which gathers us together to share not just food, but stories, recreating the spirit of Chinese dining. As a girl growing up in Taipei, Chiuho ate the best food in the world. Variety and plenty were the norm in the city just outside her door. She was passionate about food then, but it wasn’t until her 30’s that she turned that passion into recreating the foods and flavors she loves. She left a photojournalism career in Taipei to attend culinary school. Today her eye for beauty makes itself known on the plate in classic and traditional Chinese recipes executed with a flare for freshness that favors local ingredients whenever possible. A shared passion for great food animates the entire staff at A Single Pebble; you can feel it in every aspect of the dining experience, from the diverse daily specials to the music and table settings. You’ll remember it even in the artful way the bussers clear your dishes.